Oysters with lobster and saffron bisque. Much has been made of the Oyster Festival's fence, and how to get around it, but it hardly matters. You're not truly inside until you breathe the rarified air of the VIP lounge in the Plaza Grill, gazing down on the plebeians on the plaza. You also get to glimpse the blue tarp of secrecy behind which 12 judges, drunk with power, and only power, since they aren't allowed any wine until after the judging, sample entries for "Best of the Oyster Festival." 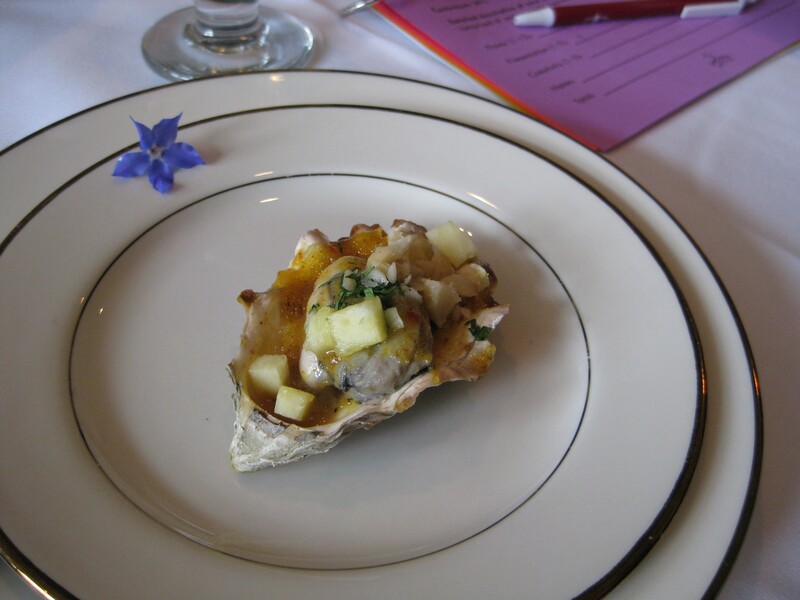 This year's judges tried eight raw and nine cooked offerings, as well as a handful of non-oyster goodies. Glamorous servers glided around the long table like ring girls at a fight, passing out dishes of bi-valves topped with everything from bacon and garlic to tobiko and mandarin slices. 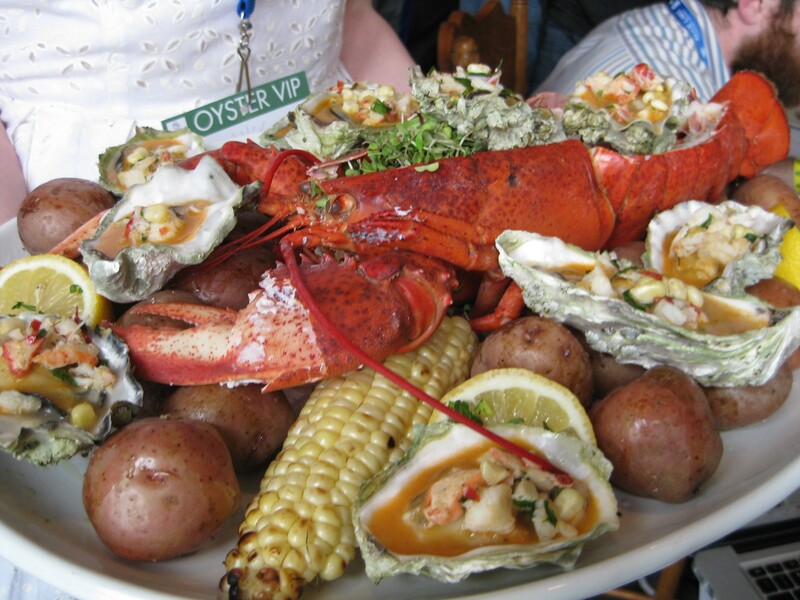 A platter of oysters with saffron bisque piled atop a whole lobster elicited oohs and ahhs from the crowd, followed by furious scribbling on ballots. The ballots bore descriptions of the dishes, but no information on the entrants. Sweet chili and fish sauce topping impressed the panel both on the raw and cooked oysters. One deep-fried entry suffered a bit from cooling off, but mostly the competition was stiff. Asked to name his favorite so far, judge James Wilson rattled off five. Paris Lee of Pro Pacific Fresh has judged nearly every year since the festival's beginning, and even won it one year with a grilled oyster on polenta with marinara sauce. He feels that "the chefs have really stepped it up in the last few years." Oysters with sweet chili, fish sauce and cilantro. The oyster ice cream cones were deemed gutsy, but iffy. A few folks were happy enough with their cones until they hit an oyster chunk, while others felt vanilla was not the way to go. The ice cream itself was just slightly briny, like you'd dropped it on the beach. Still, it was a pleasant surprise for some, and memorable for all. Betty Burton, glittering in a red sequined hat, has been judging for 20 years. In the early days, things were less formal, with judges scooting around to the back of vendors' tents for samples. 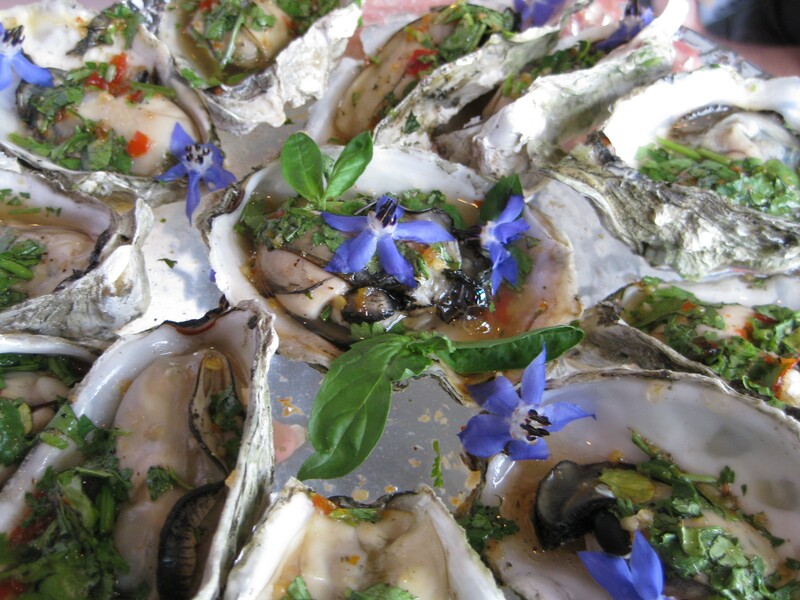 Some oysters from past festivals stand out in her memory. Eighteen years later, Burton is still haunted by a perfectly done tempura hand-roll from Tomo. BBQ oyster with pineapple curry sauce. A month shy of his 13th birthday, Michael Berkowitz was the youngest judge at the table. No one contested his authority because he has been eating oysters "since birth," a fact corroborated by his mother beside him. Michael did balk momentarily when the non-oyster entries began with a "Rocky Mountain Oyster," fried calf testicles. In the end, he cowboy-ed up and made his mama proud. The non-oyster category was a bit of a hodge-podge, with a yellow curry coming hard on the heels of an apple fritter. Tomo snagged Best Raw Oyster with its hot and sour shooter, which was terrifically plump and creamy with a tart sauce. The big winner for the cooked category was Toni's. Who knew? The purveyors of cream pies and Thai truck food won the judges over with their grilled oyster in a bright dressing of sweet chili, fish sauce and cilantro. Best in Show went to Sushi Spot for their wasabi vinagrette shooter, BBQ oyster with island curry and their non-oyster sushi roll.